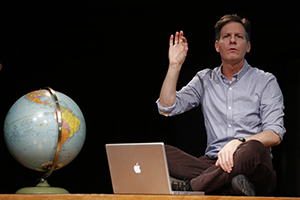 Martin Moran, writer/performer of The Tricky Part and All The Rage, at A.C.T.’s Strand Theater November 29th through December 11th, interviewed by Richard Wolinsky. In September 2005, Richard Wolinsky spoke with Martin Moran, a Broadway performer who’d written a memoir, The Tricky Part. At the time, he’d already performed in Titanic and revivals of How to Succeed, Bells are Ringing and Cabaret on Broadway, and off-Broadway in A Man of No Importance and Floyd Collins. In his memoir and his shows, he talks about sexual abuse, coming out as a gay man, and life as a Broadway chorus boy. Since the interview, Martin Moran spent four years in various roles on Broadway in the hit Monty Python show, Spamalot. A.C.T. website for more information.